Garnets are a group of silicate minerals that have been used since the Bronze Age as gemstones and abrasives.All species of garnets possess similar physical properties and crystal forms, but differ in chemical composition. 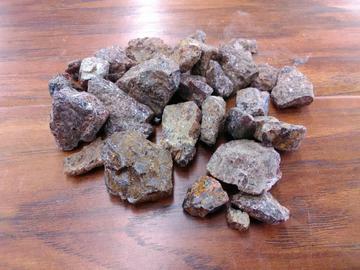 The different species are pyrope, almandine, spessartine, grossular, uvarovite and andradite. The garnets make up two solid solution series: pyrope-almandine-spessartine and uvarovite-grossular-andradite. Small dark red pieces.